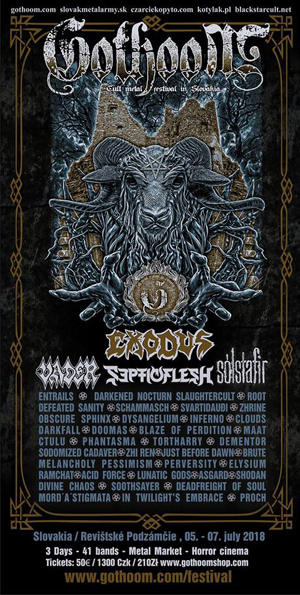 Holiday of Slovak fans of the heaviest metal genres is ready for its ninth edition. It will take place in the lovely environment under the ruins of Revište castle for the second time. A minute from the highway, yet in the centre of Slovak nature. Spacious premises, market with metal merchandise, food for meat eaters as well as vegans but first and foremost, three days full of the best extreme music. This year, the festival will take place a bit earlier than usual, so we will start on the 5th of July with the black metal day and then continue until the 7th with a variety of metal’s genre palette. Our headliner will come from the first wave of American thrash metal. The legends, one of the first bands of the genre, EXODUS haven’t lost a bit of their edge either in studio or live and they will deliver a relentless thrashing show. They will be joined by another band that formed a genre, VADER, one of the fathers of European death metal. We will also welcome the returning symphony masters SEPTCFLESH. A very special spice will be brought by a triad of Icelandic bands, each possessing a unique and unbelievably strong atmosphere – SÓLSTAFIR, SVARTIDAUÐI and ZHRINE. The atmosphere will be strengthened by a number of quality black metal in the form of mystical Swiss SCHAMMASCH, ungraspable DARKENED NOCTURN SLAUGHTERCULT, Czech stars of the classic black ROOT and their modern followers INFERNO, Polish hypnotics BLAZE OF PERDITION and their natives MORD’A’STIGMATA. The fans of death metal will not be dissapointed either. They will be awaited by raw Swedes from ENTRAILS, masters of brutal tech death DEFEATED SANITY, oriental MAAT, atypical SHODAN as well as the best of home death metal scene personified by BRUTE, PERVERSITY, TORTHARRY, DEMENTOR, DYSANGELIUM or MELANCHOLY PESSIMISM. The fans of slower post and doom styles will be delighted by crushing OBSCURE SPHINX, international CLOUDS and the homies from DOOMAS. Revištské Podzámčie, 5.-7.7.2018, 41 bands from the best of extreme metal from the whole world.